Donohue, one of the predecessor companies of Resolute Forest Products, has roots that go back to 1913 when brothers Timothy and Charles Donohue went into business in the town that is now Clermont, Quebec. The early years at this site, however, saw several different companies struggle to establish a profitable business. Like many pulp and paper companies in the early 1900s, it began with the harnessing of water power to generate electricity. A company named Labrador Power and Pulp was founded in 1900 to produce power from Nairn Falls in Clermont. Its name changed to Murray Bay Lumber and Pulp in 1906, and, in 1909, the owners started raising money to build a paper mill under the name of East Canada Power and Pulp. Unfortunately, the venture was short-lived due to East Canada declaring bankruptcy in 1912. At this point the Donohue brothers entered the picture, buying all the shares of East Canada in 1913. They created a new company, Nairn Falls Power and Pulp, which was producing groundwood pulp by 1915. Following a number of difficult financial years, the brothers established the Murray Bay Paper Company, which included Nairn Falls, and also bought shares in the St. Anne Paper Company in Beaupré, 100 km west of Clermont. 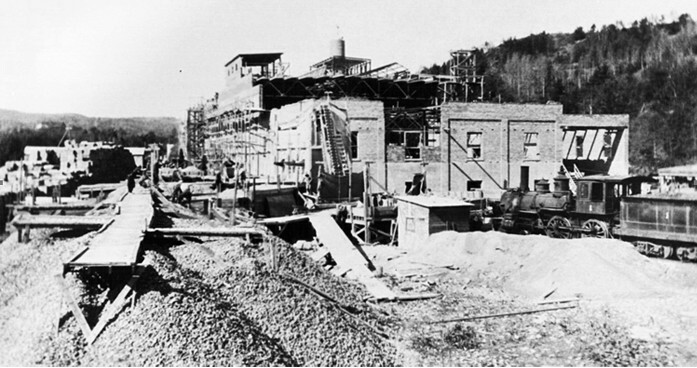 This was a newsprint mill being built with two paper machines plus groundwood and sulfite pulping facilities. Timothy Donohue was appointed president of St. Anne, and the Clermont mill began producing newsprint in 1927. But first there was another change in ownership. This was precipitated by a huge surge in newsprint capacity in Canada, with a resultant drop in prices. In 1928, Abitibi Power and Paper engineered a 5-way merger of rivals, which included Murray Bay and St. Anne. The Donohues accepted the merger, but continued to run Murray Bay as an Abitibi Power and Paper subsidiary for the next few years. In 1932, however, Abitibi went into receivership during the Great Depression, and the Donohue Company bought back the Murray Bay asset from Abitibi in 1934. In March 2000, Abitibi-Consolidated announced that it had entered into agreements to purchase all of the outstanding shares of Donohue, merging the two companies into a newsprint giant. If you would like to learn more about the history of Resolute Forest Products and its predecessors, you can purchase the recently published Resolute Roots by clicking here. Does it cover the Minnesota Pulp and Paper Company (Mando)?